The guardians in sailor suits return in this definitive edition of the greatest magical girl manga of all time! 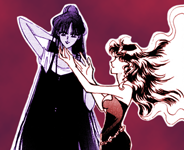 Featuring an extra-large size, premium paper, and an all-new translation and cover illustrations by creator Naoko Takeuchi! Well this should be interesting, can't speak for Kodansha's other manga releases lately but the Attack on Titan OADs they recently released with volumes 17-20 were handled very well so I guess we can hope for the best here...and if not then at least hope for better than Flanagan's translations of the previous Moon (1- & V (both) releases. Awesome. The Shinsoban translations weren't bad, just clunky. A revision would do wonders. 'Eternal Edition' is a nice and fitting name too considering it references the Stars arc. Wow, I thought Kodansha USA wouldn't do this! I'm so excited for this! I even told my friend, who's a Sailor Moon fan I can't wait to read these!! January seems so far away. I wish it would be out for Christmas, but hopefully this means the translation won't be rushed. So even in America the perfect edition will be called "eternal"? I already have all of the previous release but I'll be definitely double dipping for these since they're including a new English translation. I wasn't too bothered by the original release but I hope they'll fix some of the odd choices they made, like "Princess Beryl-sama." Also glad to see you joined the dark side, Sailor Astera! A new translation is a great opportunity! I need these!! No, wait. WANT! I'm not too fussed. I already have the complete set. So I'm not really going to throw more money away just for more accurate translations. I just finished buying the whole series this week, too. Ah well. Those colored pages are too good to pass up. 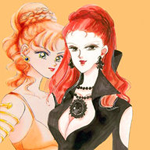 As a Sailor Moon manga collector this is great news; I never thought it wouldn't happen! This is exciting, I didn't think they'd come over. Really excited about the new translation, too. Hopefully they'll include more extensive liner notes. Here's a question, did any of the Japanese releases include anything new and if not then how about the punch comics that was in the last release (the mini-comic strips that Kodansha USA didn't bring over)? They're quality control is much improved then it was back then. Maybe they will get a consistant letterer as well. Which translator would you want? My vote is for the Nibley sisters. If they get rid of the terms like "Evil Spirit, be exorcised", I'll be relieved yet annoyed. That term and others like it stuck around just long enough to make the redub awkward. January 2018. Hell of a long time to pre-order a book. I'll wait for a listing in Previews. An all new translation means "translator" William Flanagan shouldn't have his name mentioned like at all. It took Kodansha USA a while to finally get another translator for their 1st set of republished books. I hope there will be color pages this time. I'll re-buy. It will make... how many sets? Their quality control is much improved then it was back then. Maybe they will get a consistant letterer as well. Which translator would you want? My vote is for the Nibley sisters. Oh god, no. I'd rather not have them. They worked on Negima and I think some of UQ Holder. It seems like they are Kodansha USA's go-to translators. What should be done is some sort of survey to see what terms are most popular among fans for key phrases and ones that are accurate and literal to the original work and find an agreement and compromise. And of course, keep colloquial and slang English out of it, keep honorifics, and just make a translation that can't be dated. I know so little, but at least I know it fluently! These opinions are fictional. Any resemblance to actual opinions, mine or someone else's, is coincidental. No honorifics, for the love of god! We don't use them in English; they have no business in an English translation. Including them is lazy and improper. That is the literal recipe for a dated translation. It's an English release so put as much of it in English as possible. If you want random Japanese words and honorifics left in then the previous release is still in print.